Nine men and one woman were arrested after the PSNI swooped on homes across Tyrone, Derry, Antrim and Armagh on Saturday. Three men were subsequently released. On Monday an emergency meeting was held between senior PSNI commanders and Sinn Fein in Tyrone after families of those arrested raised ‘serious concerns’ about the searches. The arrest and search operation in Tyrone started at 4am in the morning when children and other family member were asleep. The homes were violently stripped of various items of personal property, including cars. The use of police dogs terrified the children. Among those arrested in Lurgan, County Armagh were Paul Duffy, Damien Duffy and Shane Duffy, three family members of prominent republican Colin Duffy. During a subsequent court hearing, family lawyer Joe McVeigh said that the PSNI interrogated Paul Duffy’s children and Shane Duffy’s mother on video tape during the raids. Mr McVeigh said that children had been subjected to similar degrading treatment during the Nazi era. Sinn Fein Councillor Sean Clarke questioned “the sheer scale” of the operation in Greencastle and in Dunamore on Saturday afternoon, which he described as “overkill”. “There were dozens of personnel deployed in minibuses, jeeps and cars. A statement issued in the name of the family and Friends of republican prisoners at Maghaberry said the house raids and subsequent charges were clear attempts by the Six County state and the British Direct Ruler “to stem the growing awareness and discontent” around the malpractice of the prison regime and the criminal justice system. “The brutal practices of strip-searching and control movement, the internment of Marian Price and Martin Corey, the illegal detention of Gerry McGeough and the use of draconian laws are all examples of how little has changed in the operation of British Rule in the six counties. They said that the refusal of the nationalist community “to accept the status of second class citizenship” and “turn a blind eye” to injustice has resulted in the PSNI becoming more and more desperate. “Such desperation is reflected in the latest attempt to force the ‘croppies to lie down’ and remain silent about their oppression. “However, just as in the past, Irish republicans will refuse to be cowered down by British repression and the F&F group will re-double their efforts to expose the injustices of British mis-rule. There were disturbances in Craigavon in north Armagh on Tuesday this week after two local republicans were handed maximum prison sentences. A van was hijacked and set on fire in the trouble. 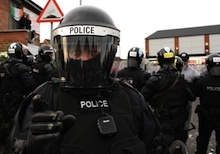 There were also clashes between local youths and the PSNI in Newry on Thursday, with some petrol bombs thrown. Former Sinn Fein councillor Brendan McConville was sentenced to 25 years in prison and John Wootton to 14 years before either can apply for parole. They were sentenced for a Continuity IRA attack in 1989 in which a member of the PSNI died. Both have been behind bars since 2009. Wootton was 17 years of age at the time of the attack, a fact blamed by the judge for forcing him to impose a shorter prison sentence. Following an outcry by unionists, prosecutors said they would seek to have the law changed to allow the sentences to be increased.